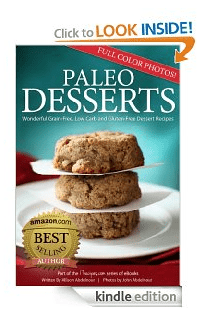 Head over here and grab a FREE Paleo Desserts eBook today on Amazon! Be sure when you check out the price still says $0.00 because Amazon prices tend to change quickly. It can be difficult to get low sugar desserts with no grains but the Paleo Desserts eBook is here to help! By Jennifer on March 13, 2013 Desserts, Frugal Living, Paleo Recipes.